New feature in chat (partys) today guys! 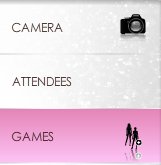 Its called Quiz, and you can quiz all of your friends in the party on questions about fashion and stardoll. Stardoll give you the questions, and you battle against your friends to get the most correct answers! The first person to get 10 stars wins! They get an animated star by there doll, and then the room returns to normal. Do you like this new feature? Will you be using it?